This angel needs some more respect from Team G. He’s got 10/10 in my book in choosing a battleground. -10 cool points to the unicorn for recognizing the location. 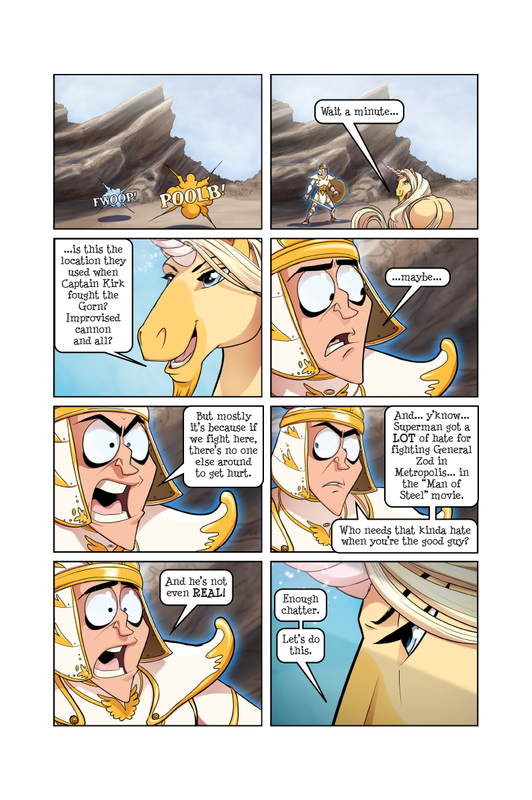 But the Unicorn can get those points back by talking like Shatner through the battle. Is there a reason our angel hero’s eyes flicker from black to blue in different panels? I found it rather distracting. @Lalasa – it’s clearly his Angel Aura flicking with righteous rage and fury. If you close one eye, it gets half as distracting. And if you close both eyes, you fall asleep. @Charlie Spencer – Not with my kids in the house. I seem to recall that the Mythbusters proved that the improvised cannon was impossible. You need to mix the ingredients for gunpowder a lot more carefully and thoroughly than Kirk had any chance to do, otherwise they just won’t explode (or even burn well). Also, even if the improvised gunpowder had exploded, it almost certainly would have made the bamboo cannon barrel explode like a bomb and killed Kirk. But I remember it was a fun episode anyway. Elfguy, I’m afraid it’s quite the opposite. Well Melkior, you know how it is with Hollywood…they only use the Laws of Physics enough to create an *illusion* that the Laws of Physics can’t support.